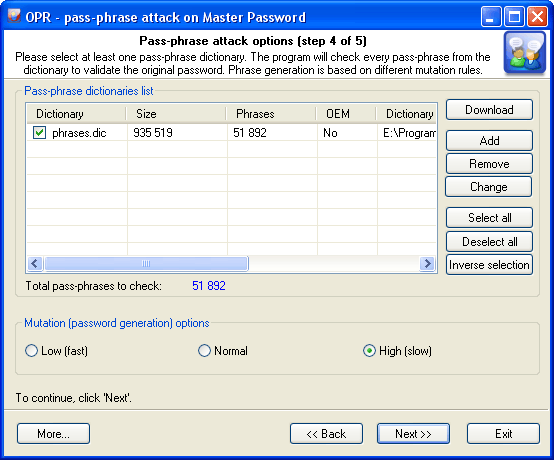 Pass-phrase attack is an essential password recovery tool, which can hardly be overestimated. The idea of the attack developed by Passcape is to guess the right password by searching through predefined frequently used expressions, phrases, and word combinations. Similar to the simple dictionary attack, from the source dictionary we sequentially take a phrase and attempt to match with the original password. More and more users choose to make up their passphrases of entire phrases, passages from poems, movie aphorisms, Latin aphorisms, etc. Attempting to recover such passwords using the traditional techniques is unthinkable, even with the reference to the advancement of the computing power of modern computers. Therefore, the recovery help comes with the predefined and known phrase attack. Large online dictionaries, in the areas of music and cinema, by much increase the chances for the success. It wouldn't be an overestimation to say that 99 percent of the success in the recovery of a password with a dictionary attack depends on the quality of the dictionaries. Most likely, that is the reason why this type of attacks doesn't appear in just about any password cracker. Passcape Software allows utilizing a whole set of online and offline dictionaries (totally over 500 MB) compiled especially for this type of attack. Use strong mutation whenever that's possible. As you might have known strong mutation significantly raises chances for the successful recovery. Weak mutation is normally justified in only one case: for increasing the attack speed or when using dictionaries of large sizes. Medium mutation is a normal balance between the operating speed and the number of generated password phrases. Strong mutation allows finding more difficult passwords by generating the widest range of all possible combinations, to the prejudice of the search speed. For instance, English phrases typed using the national keyboard layout, abbreviations, etc. Usually, a Passcape program comes with a short dictionary of phrases and aphorisms.